Q: How long can I use my Baba Sling for? A: Baba Slings are suitable for use from birth. As with all baby carriers, proper care and attention must be taken with your newborn. The upper age limit is dependant on the wearer's ability to comfortably carry their baby's weight. Many parents continue to use their Baba Sling beyond 3 years of age. Q: Can people with back problems use a Baba Sling? A: Yes! However, depending on the seriousness of the problem you may wish to consult with your doctor. The beauty with the Baba Sling is that as you can easily alternate between several positions. Changing positions is essential while carrying baby, as it will redistribute the weight of your child to different areas of your body. This will avoid unnecessary stress on any one point for extended periods. We also suggest you alternate shoulders regularly, especially if you are prone to back problems. As baby grows and is going through “needy” periods of constantly wanting to be held, the Baba Sling can actually help save your back. Using the Hipstar will remove the necessity to have your hip awkwardly jutting out and allows you to stand straight (not to mention be hands free!). The Baba Sling has a unique double adjustable strapping system, which allows you to bring baby's weight into your centre of gravity. Again this will minimize stress to your back. The trick is to have the upper strap pulled nice and tight. A good way to tell if the upper strap is too loose is if you feel it necessary to constantly support baby with your hands; probably you need to tighten the upper strap a little. Q: I have a heavy toddler. Can I use the Baba Sling? A: Yes. Be sure to change shoulders periodically. A good tip is to slide the shoulder padding off your shoulder and onto the upper arm. Have the Baba Sling adjusted as tightly as possible so that baby's weight isn't pulling you forward. 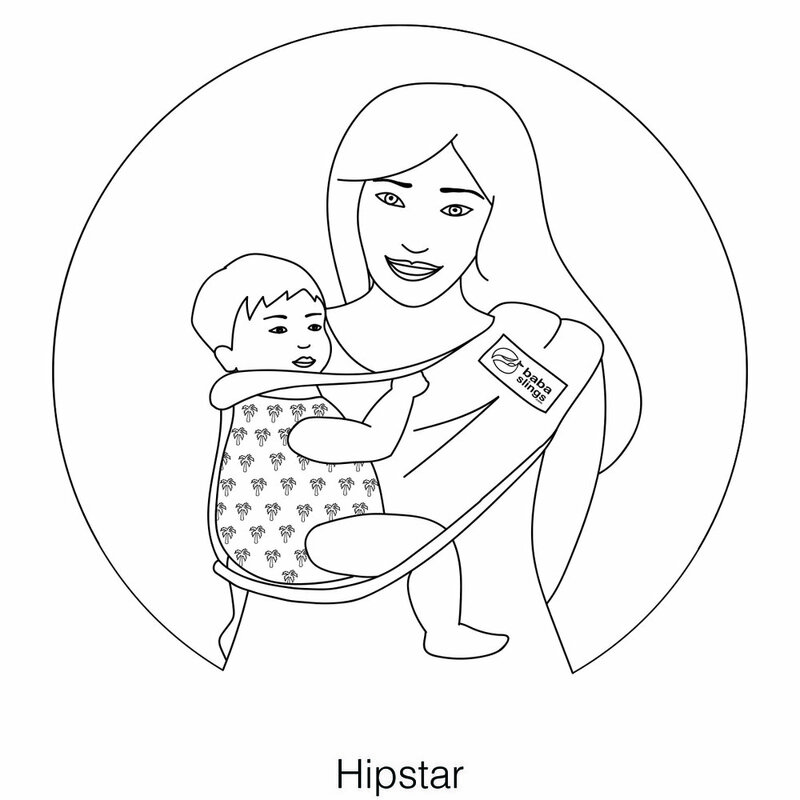 Carrying in the Hipstar position is generally best with toddlers. Imagine yourself being cradled in a comfortable and soft hammock where your entire weight is totally supported. This is the difference between the upright carriers and the Baba Sling. Q: Does the Baba sling put any pressure on my baby’s spine? A: Spinal care is vital in early months and years to ensure the correct development of baby's skeletal structure. Many health care practitioners such as osteopaths and chiropractors consider the hammock style of the Baba Sling to be ideal for healthy spinal development in infancy. Unlike upright carriers the Baba Sling puts no unnatural pressure on baby’s soft and undeveloped hips and spine. It is specifically designed to support baby’s entire weight comfortably and evenly. When baby is in an upright position in the Baba Sling you may notice that their weight is not held between the legs but rather is supported by the hammock of the Baba Sling, which encircles their entire bottom right up to their knees. When using your Baba Sling, you will notice that there is no barrier between baby and yourself. It is very similar to the popular skin to skin contact of “Kangaroo Care”, which is a form of care that is employed for premature babies. Many Upright carriers do not allow for this intimacy. Q: What is the Baba Sling made of? A: The Hammock is 100% cotton drill – durable, breathable and strong yet not too thick. For your comfort the Baba Sling is designed with foam shoulder padding. The railings also have ample foam padding for baby’s comfort and protection. There is a large buckle and a smaller safety buckle (with nylon webbing). These are made from tough and durable acetyl. Q: Will the fabric fade? A: Being 100% cotton, naturally the fabric will fade a little over time. The fabric is colourfast, so the fading should be quite minimal. Q: What is the best position to carry a 1-year old? A: The Hammock Style, Upright and Hipstar positions are the most popular at this age. Please refer to Instructions and note the age guide mentioned for each of the positions. Q: My baby fusses when I put him in the Baba Sling, do you have any tips? A: Practice with a doll or teddy first so you are completely confident in what you are doing. Babies are very sensitive to what their parents are feeling. In the initial stages it may be helpful to use the Baba Sling when you are feeling calm. Go with baby for a walk, do the little parent “Jig” or feed them in the Baba Sling. This will usually pacify them. Alternatively, try different positions; some babies don't like having their faces covered or their legs inside the hammock. Try exposing their head, arms and feet. Have confidence! Thousands of families have greatly benefited from using the Baba Sling. So do persist. Q: Does it take long to take the Baba Sling on and off? A: Not at all!! The beauty of the Baba Sling is that it is very simple to take on and off! The first couple of times you use it you may have to experiment a little with adjusting the straps. Once that is clearly understood it literally is a matter of seconds. Q: Can I put the Baba Sling on without needing assistance? A: Absolutely! Once you get the hang of it you can easily shift from one position to the next. We do suggest you ask for help though until you are totally confident. Especially when using back positions. A: In some cases delivery can be 1 day. International postage, could take up to 3 weeks. A: Yes. Postage and packing costs are non-refundable and return postage costs are the customer’s responsibility. Goods must be returned by recorded delivery mail with the original purchase receipt and must be in a resalable (as new) condition within 14 days of receiving. Q: Does the Baba Sling have a warranty period? A: Yes. The Baba Sling has a 1-year warranty period. Q: My partner is a bigger man; will the Baba Sling fit him? A: As the Baba Sling is adjustable; it fits most people, large or petite. A: Yes. We suggest you use a gentle cycle, and make sure that the buckles are both clicked up. Do not tumble dry, as it may damage the buckles.